Jeff and Ella making and decorating the gingerbread house. 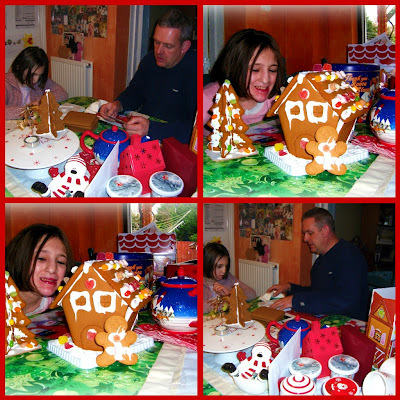 Well, Jeff did the building work and Ella did the prettyfying! Oops, gender specific roles there LOL And ironically enough she doesn't even like gingerbread - but made up for it with the sweeties! Dad and Sandra came up on the 27th, with our Christmas presents. This bag was my present. Sandra had seen it in Roma when they were there a few weeks ago and thought it was so me. I would so have to agree! I couldn't stop grinning, picking it up and stroking it, bit sad really LOL Wednesday Jeff and I went for another walk around Swinley Forest, without Ella this time. It's amazing how much further one can walk without Ella! Thursday we had to take Ella to John Radcliffe for a check up. Her EEG result is ok, no deterioration in the epilespy, so that's good :) They also gave her an ECG just to check the drop fits hadn't been misdiagnosed. ECG was fine :) They would though like us to film her drops. Easier said than done! Took Ella to Pizza Hut afterwards for a treat. Last night watched Little Shop of Horrors. I love that film! Will never forget when I saw the live show and the ending was different - was most unimpressed! DWP phoned and confirmed they can't recommence the DLA and CA until the school have 'done their bit.' With this is mind, you can imagine how blue the air was when we found out the phone bill was £150 .......for one month!! Mobile calls now barred. Today Joshua is 19, dear Lord, my kids are getting old!